This isn't the type of update you all look for, I know. But, I have to share when I find something so good. My morning sickness has been so bad this time that I haven't been up to cooking. Mark has done most of the cooking for the past 12 weeks or so. Now that I'm feeling better, I'm getting back to my adventurous self in the kitchen. Tonight's meal was no disappointment! 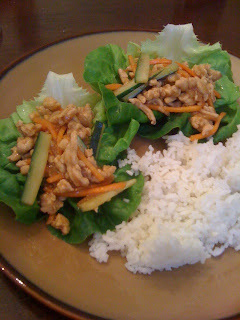 Here is the recipe for the Asian Lettuce Wraps. Don't be intimidated. They are super easy to make. The hardest part was chopping the onion and garlic. I made a few changes. I cut the onion in half because Mark doesn't really like onion. I substituted cucumber for the bean sprouts because I'm pregnant and bean sprouts are often the culprit of food born illness. I also added double the teriyaki sauce. Next time I am going to add some chopped peanuts, too! Fabulous!! Excuse the white rice. I know it's not the healthiest, but I can barely handle brown rice when I'm feeling top notch. Add the last remaining nausea from morning sickness and I'm not even gonna attempt to eat brown rice. haha. excuse my crappy iPhone pic. Looks yummy! I'm always looking for easy and tasty recipes! I feel your pain. Completely. I don't think I was able to cook for about 7 or 8 weeks. Ugh. These lettuce wraps look good - we get something like that at PF Changs (one of our favorite places!) - I might need to make these!! I hope you are feeling better. There is nothign worse than feeling that way day after day with no end in sight!